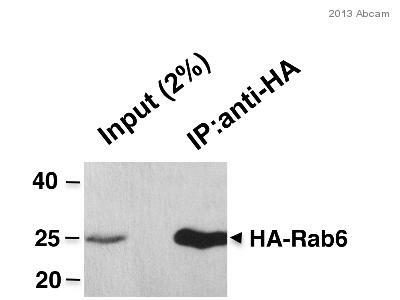 The antibody detects HA-tag fused to the C-terminus or N-terminus of targeted proteins in transfected cells. 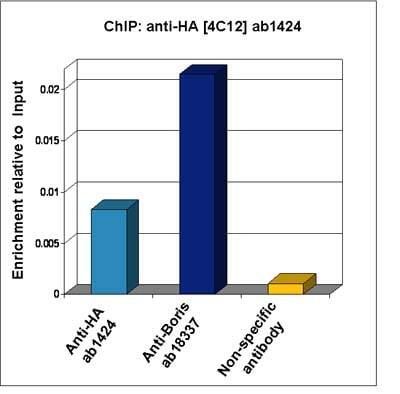 The antibody works in ChIP but less well than ab9110 (see ChIP data). 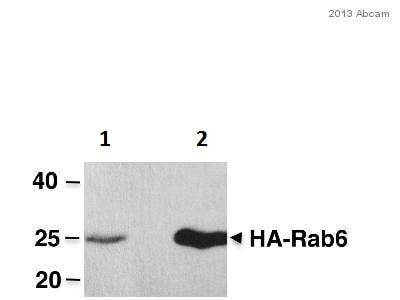 WB: Rab6-HA transfected HEK-293T whole cell lysate. 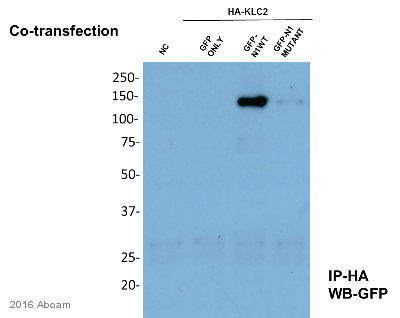 IP: Rab6-HA transfected HEK-293T whole cell lysate. 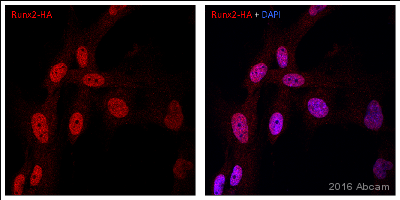 ICC/IF: Baby hamster kidney cell expressing HA-tag CFTR protein. ChIP: Xenopus laevis oocytes injected with mRNA for HA-tagged human BORIS. Our Abpromise guarantee covers the use of ab1424 in the following tested applications. ChIP Use a concentration of 3 µg/ml. 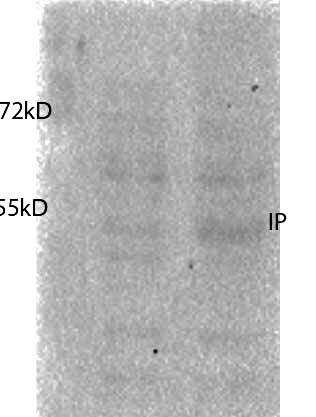 Use 3 µg per 25 µg chromatin (see figure legend). Immunocytochemistry/ Immunofluorescence - Anti-HA tag antibody [4C12] (ab1424)This image was kindly supplied as part of the review submitted by one of our customers. This picture shows baby hamster kidney cell expressing HA-tag CFTR protein. 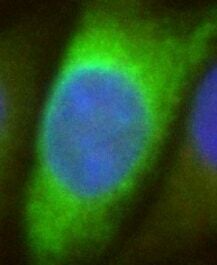 This type of cells were grown on coverslip and immunofluorescence was performed. Dilution of 1:200 was used and incubated for 2hrs with antibody. 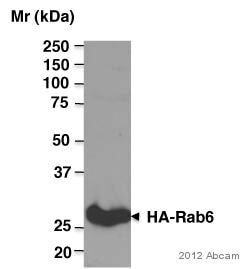 Recombinant HA-tagged Rab6 was immunoprecipitated from 1 mg transfected HEK-293T (human epithelial cell line from embryonic kidney transformed with large T antigen) whole cell extract with 2 μL ab1424. Lane 2: ab1424 IP in Rab6-HA transfected HEK-293T whole cell extract. Xenopus laevis oocytes were injected with mRNA for HA-tagged human BORIS. Chromatin was prepared according to the Abcam X-ChIP protocol. Oocytes were fixed with formaldehyde for 10min. 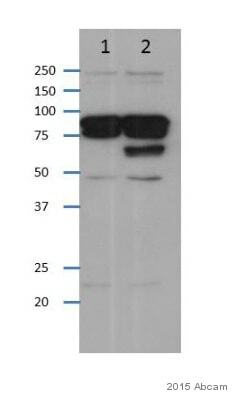 The ChIP was performed with 25µg of chromatin, 3µg of ab1424 (anti-HA, light blue) and 3µg of ab18337 (anti-BORIS, dark blue), and 20µl of Protein A/G sepharose beads. A non-specific antibody was used as a control (yellow). The immunoprecipitated DNA was quantified by real time PCR (Taqman approach).